St. Louis Cardinals executives Bill DeWitt Jr., John Mozeliak and Michael Girsch met with agents for Marlins outfielder Giancarlo Stanton on Friday in Los Angeles. The meeting occurred one day after a similar get-together with the San Francisco Giants. Though it was initially said that Stanton was not present, national writer Jon Heyman of FanRag Sports reports the outfielder did participate in both sessions. Both teams have made formal offers to the Marlins for Stanton, and it has been reported that the Marlins have found both to be acceptable. Credible reports say the Cardinals’ offer includes RHP Sandy Alcantara and includes more money than believed to have been offered by the Giants. The final decision appears to be Stanton’s, given his full no trade clause means he can veto a trade to any team. Stanton has reportedly not ruled out either St. Louis or San Francisco, but that his preference is said to be a West Coast team. The Dodgers appear to be Stanton’s preferred landing spot, logical given that Stanton is from the Los Angeles area. It is unknown whether the Dodgers are seriously interested in acquiring the slugger, as no formal offer from the club has been reported. Even without Stanton, the team already has serious salary cap issues, but also has significant financial resources. A deal is expected to be finalized within the next 2-3 days, according to several sources. In a deal announced on Friday, the Cardinals have parted ways with infielder Aledmys Diaz, sending him to Toronto in exchange for minor league outfielder J.B. Woodman. The Cuban infielder was signed by the Cardinals in 2014 on a four-year deal worth $8 million. After spending two seasons in the minor league system, Diaz made his major league debut in 2015. Following a season in which Diaz was St. Louis’ representative to the 2016 MLB All-Star Game, the infielder struggled early in 2017. He was optioned to Memphis, where he remained for the duration of the season, called up only after the Triple-A season ended. Diaz was replaced at shortstop by Paul DeJong, who had an outstanding season, coming in second place for the NL Rookie of the Year. The performance of DeJong put him ahead of Diaz in the shortstop pecking order, leading to the trade to the Blue Jays. The move may give the Cuban infielder, who also played minor league innings at second and third base, a chance to be an everyday player in the majors. Diaz is one year removed from arbitration eligibility. Woodman was the Blue Jays’ second-round draft pick in 2016 and was the organization’s No. 28 prospect, according to MLB Pipeline. The outfielder, who bats left handed, hit .240 with an OPS of .699 in 96 games for the Jays’ Class-A Lansing Lugnuts of the Midwest League. Woodman turns 23 this month and has played in both center field and right field defensively. 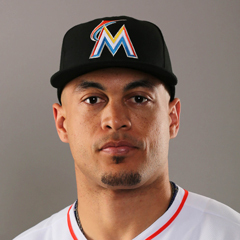 The Cardinals met with representatives of Giancarlo Stanton in Los Angeles this past week. See details above. Jon Morosi of MLB.com reports that the Marlins have agreed to general framework of deal with both the Cardinals and the Giants. The final decision will be made by Stanton, and a decision is expected within the next 2-3 days, according to Craig Mish, sports radio host for SiriusXM. Mish also reports that the Cardinals offer to the Marlins includes more money that the Giants are willing to pay. 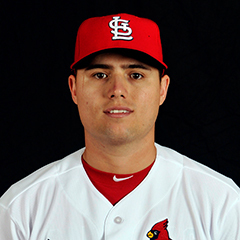 12/1 The Cardinals traded SS Aledmys Diaz to the Toronto Blue Jays for OF J.B. Woodman. The deadline for tendering contracts to pre-arb and arbitration eligible players passed on Friday. The Cardinals tendered 2018 contracts to all three of their eligibles – Michael Wacha, Tyler Lyons and Randal Grichuk. The Winter Meetings are scheduled for December 10-14 in Orlando, Florida. The Rule 5 draft will occur on the last day of the meetings. The Cardinals annual Winter Warmup is scheduled for January 13-15 in St. Louis at the Hyatt Regency Hotel. The annual BBWAA dinner is scheduled for Sunday the 14th at the Union Station Hotel in downtown St. Louis. Tickets for the Winter Warmup are on sale now either online at Cardinals.com or at the Busch Stadium Box Office. Admission tickets are $40 for the three-day event. 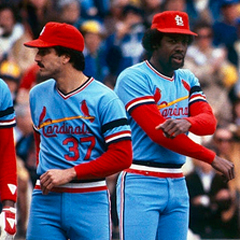 This week’s Blast from the Past features the 1981 St. Louis Cardinals. The 1981 season was the 100th season of the franchise, though the organization recognizes 1892 as its debut. The 1981 Cardinals finished the truncated season with a record of 59-43, which placed them first in the National League East. The season was shortened by a player’s strike that began on June 12 and ended on July 31, with the season resuming on August 9 with the All-Star game. The strike forced cancellation of 38% of the MLB schedule. Because the season was split into two halves, and the Cardinals finished in second place in both halves, they did not qualify for the playoffs. The manager of the 1981 Cardinals was Whitey Herzog, his second season as manager. Herzog also served as the Cardinals’ general manager, a position he would hold through the 1982 season. The Cardinals were owned by Gussie Busch and Anheuser-Busch. The Opening Day lineup that season was Garry Templeton (SS), Ken Oberkfell (3B), Keith Hernandez (1B), George Hendrick (RF), Darrell Porter (C), Sixto Lezcano (LF), Tony Scott (CF), Tom Herr (2B), and Bob Forsch (P). The longest losing streak was five games, from Sept. 5-9. The longest winning streak was eight games, from April 16-26. The largest winning margin was a 13-0 victory over the Pirates on May 9. The worst loss was a 10-0 defeat by the Cubs on Sept. 7. Home/road splits were 32-21 at home, and 27-22 on the road. The top starting pitcher was Forsch, with a record of 10-5 and an ERA of 3.18. Top position player performances came from Hernandez, with a slash line of .306/.401/.463, 8 HRs, 48 RBI, and Hendrick, slash line of .284/.356/.485, 18 HRs, 61 RBI. Hernandez won his fourth Gold Glove Award in 1981. The notable in-season trade was a June 7 swap of Scott for pitcher Joaquin Andujar, with the latter soon to become a star.